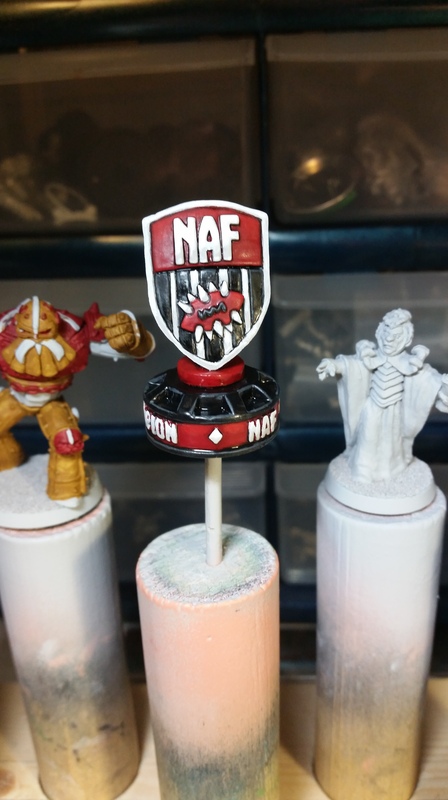 I have a couple of minis on the table right now, but I put them on hold for one night so that I could paint my first ever NAF trophy mini. As I posted previously, I won it this past weekend at Bugman’ Bowl here in Austin. I was not really sure what color scheme to go with to paint this piece, so I hopped on the Googles and did an image search for painted NAF trophies. Lots of cool images came up, but for my first NAF trophy, I decided to go with the official NAF color scheme. It also helps that the official NAF color scheme is also the official XBBL color scheme. If I ever win another one, I will probably paint it up in the color scheme of whatever team I was using when I won. So, yesterday I attended a new local Blood Bowl tournament called Bugman’s Bowl. As always, it was good to see friends and play some good games. The tournament itself was very well run and Dean did a great job for a first time tournament organizer. He has some interesting concepts such as using playing cards to randomly assign table numbers for the first game, as well as for door prize drawings at the end of the day. They added a little more flavor than using little pink or blue raffle style tickets. The most entertaining element all day was the “Get Me a Beer” hat. If any players got pushed into the crowd, the player doing the pushing would yell, “Get me a beer!” and the player who got pushed would then have to wear a large, and very silly hat until someone else yelled, “Get me a beer!” Anyone who finished the game while wearing the hat, then had to go up to the bar and exchange the hat for a free beer to give to his opponent. Very clever and thematically appropriate. Finally, while we did not get any custom tournament dice (which was a little bit of a bummer), we each got an Impact! miniature in our welcome bag. At the end of each game, if you lost your game, you could force your opponent to trade minis with you, and if you tied, you both had to agree on the trade. Like ROT Cup earlier in the year, Bugman’s Bowl was held at 4th Tap Brewery here in Austin, TX. Also like ROT Cup, I brought Chaos Dwarves as they served me pretty well the last time that I brought them.